This senior secondary school textbook became the most widely used text in Canada. It examined the essential concepts and ideas while exploring the manner in various societies have struggled to put into practice. The book also spotlighted events such as the Vietnam War, people such as Robert Kennedy and counties such as China to allow students to delve deeper and think more critically. The book was published by Oxford University Press in 1990. 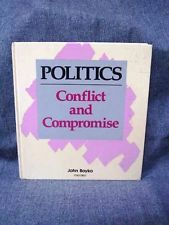 In 1998 it was adopted by New Brunswick as the text to be used for its distance education politics courses.